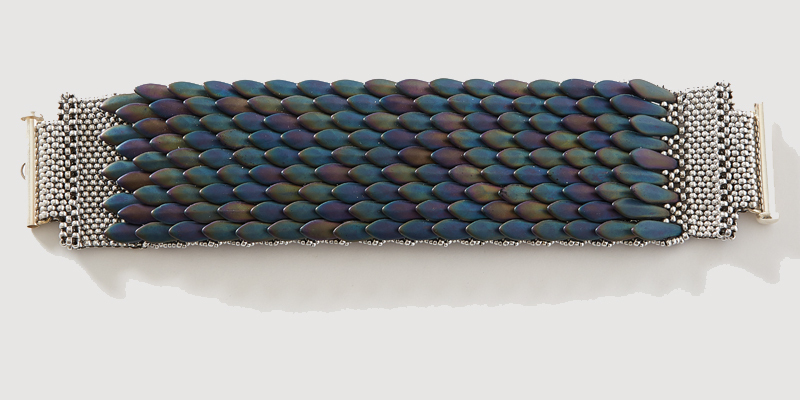 Use two-hole daggers and netting to create Michelle Leonardo’s Dragon Scale Cuff with an intriguing textual surface. Find these patterns today in Beadwork August/September 2018. To string the daggers more easily, position them on your work surface so you can see the sides with the holes facing you. Pull the thread straight through the holes of the daggers so the thread doesn’t abrade. Some dagger holes can be as sharp as crystals and will cut your thread. 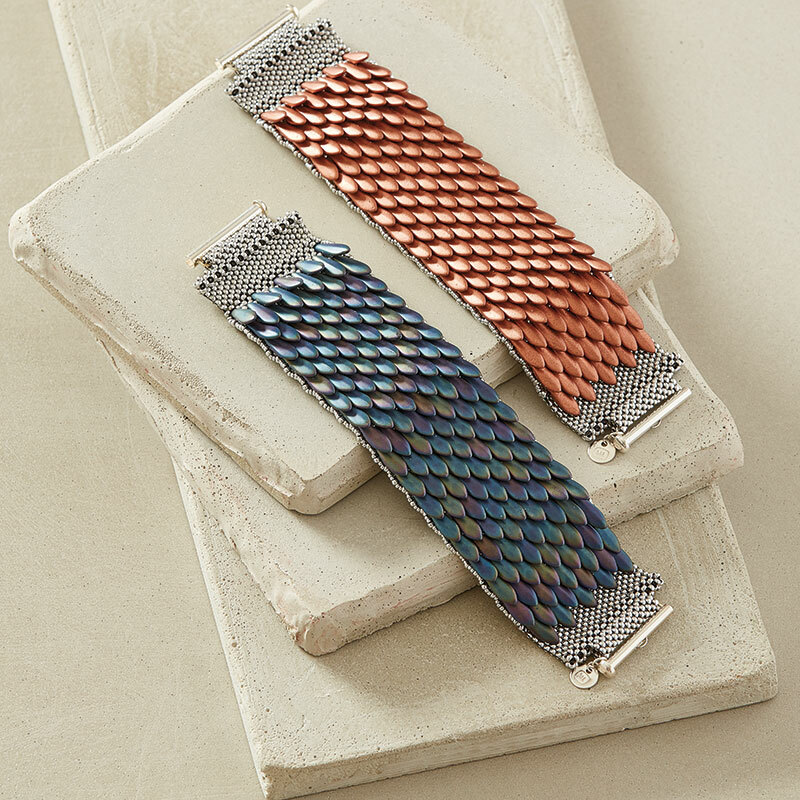 Use 8 lb FireLine to reduce the odds of the thread breaking—this bracelet is heavy! 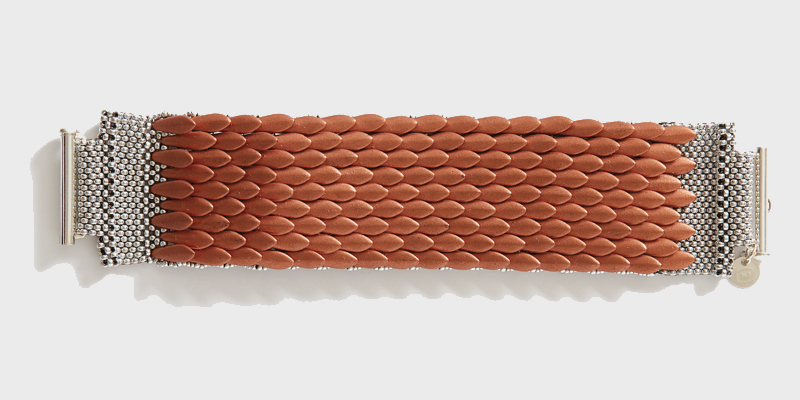 The daggers of the bracelet base will be staggered like fish scales. Keep your tension consistent so the beadwork stays straight and flat. Be careful not to stretch or bend the beadwork so the thread doesn’t break and the beads won’t misalign. After you work the netting in Step 4, the rows of daggers will stabilize. 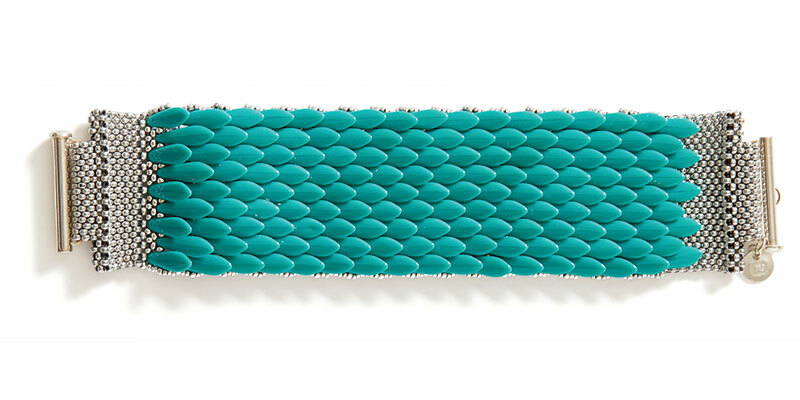 MICHELLE LEONARDO is a passionate designer who creates beautiful jewelry out of the finest glass seed beads. 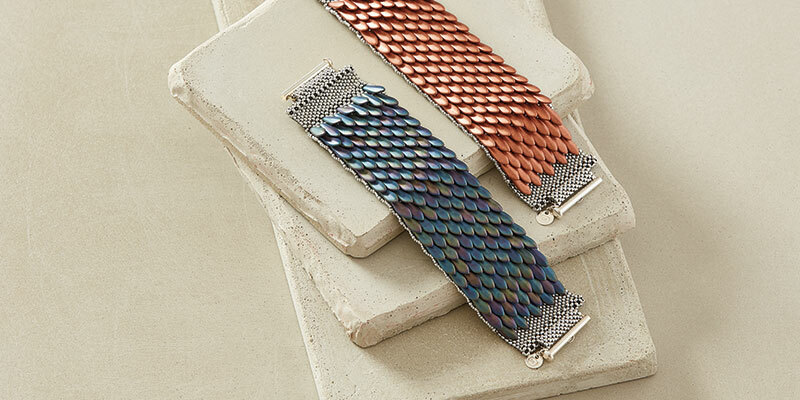 Her high fashion jewelry collection is inspired by her travels, particularly her love of the ocean. With an award-winning career in advertising and graphic design behind her—plus several recent features in publications— she launched Michelle Leonardo Design to sell her jewelry and patterns. Contact Michelle through her website, www.michelleleonardodesign.com, or connect with her on Facebook at Michelle Leonardo Design. Download this pattern plus 10 more when you purchase the August/September 2018 issue of Beadwork. To find more projects and patterns, visit the Interweave Store!